Indonesian anti-terror policeman stands guard at the blast site following a suicide bomb outside a church in Surabaya, Indonesia on Sunday. Police spokesman Frans Barung Mangera said at least four people were killed at the first attack on the Santa Maria Roman Catholic Church. He said 41 people were wounded at that location, including two police officers, while one or more of the bombers were killed. 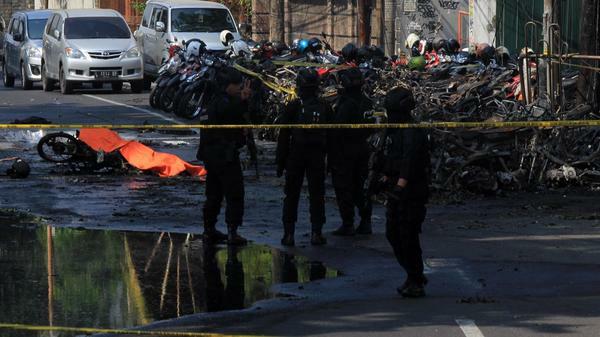 Mangera told the AP that minutes later, a second explosion went off at the Christian Church of Diponegoro and a third explosion went off at the Pantekosta Church. The Islamic State claimed responsibility for the attack via its Aamag news agency, but earlier Reuters quoted the communications director of Indonesia's intelligence service, Wawan Purwanto, as saying the agency believes it was the work of the ISIS-affiliated Jamaah Ansharut Daulah (JAD). The U.S. State Department designated JAD as a terrorist group in January 2017. The U.S. government says the group originated in 2015 from other extremist groups and its members pledged allegiance to ISIS leader Abu Bakr al-Baghdadi. The U.S. blames JAD for a suicide bombing and gun attack in Jakarta in January 2016 that left four people dead and 25 injured. Purwanto said the attacks are likely linked to a riot and a 36-hour standoff at a prison near Jakarta last week, when Islamic State loyalists killed at least five security officers, according to Al-Jazeera and Reuters. "The main target is still security authorities, but we can say that there are alternative [targets] if the main targets are blocked," he told Reuters. With more than 260 million people, Indonesia is the world's most populous Muslim-majority country. About 87 percent of the population is Muslim, while Christians make up about 10 percent, according to a 2010 estimate from the CIA. Christians have been targeted before by militants in Indonesia, according to the AP. Attacks on churches in 2000 killed 15 people and wounded almost 100. One of the most deadly attacks in Indonesia involved multiple bombs that went off inside and outside nightclubs in 2002 in Bali. The attack by the al-Qaida-linked group Jemaah Islamiyah left 202 people dead.